:: Sunrise in Borobudur :: - Dreams are what you wake up from. I was roused from my sleep at 4am by the first morning prayers of the not-so-distant mosque, which broke the still of the morning. We quickly washed up and made our way up the 136 steps to the Plataran lobby, where our guide Noordin sat waiting. It would be a quick 15-minute drive over to Manohara Hotel for our sunrise tour of Borobudur. Borobudur, we learned, is a 9th century Buddhist Temple, and the world's largest Buddhist temple. It was designed with three symbolic levels of Buddhist cosmology: Kamadhatu or the world of desire, Rapadhatu or the world of forms, and lastly, Arupadhatu or the world of formlessness. This impressive template was then abandoned subsequently when Islam took over Java, and Borobudur was eventually covered and hidden away by the ever-growing jungle. Interestingly, it was Sir Stamford Raffles, who discovered Borobudur in 1814, 5 years before Singapore was founded. A few expedition was made to study the monument, but it was only from 1902 when a grand project was commissioned to restore Borobudur to its glory. But due to budget limitations, persistent drainage problems could not be resolved. A full overhaul was started in 1973 by both the Indonesian government and UNESCO and Borobudur was finally listed as a World Heritage Site in 1991. The climb up Borobudur was not that difficult, but as we had to make our way up the steep steps in the dark, we had to be careful not to slip. After going up the steps, our guide led us to an ideal spot to catch the sunrise. 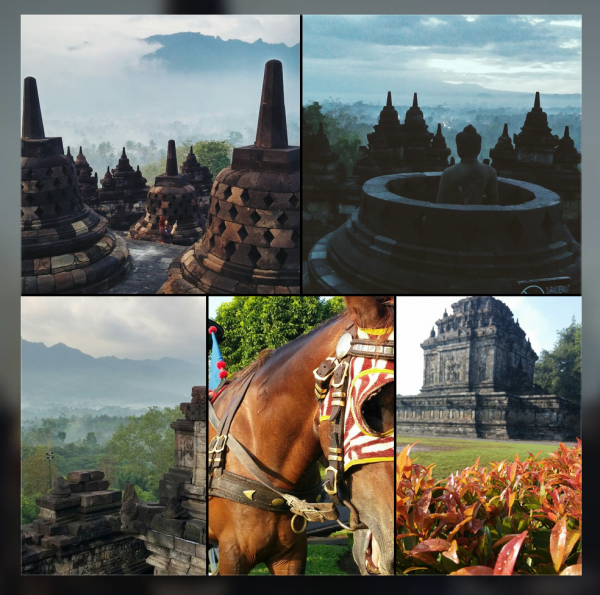 While waiting for the sun's first rays, Noordin shared some interesting facts about Borobudur. Apparently, the stone carvings and reliefs at the lower levels of the terrace were very intricate, depicting day-to-day life related to cause and effect. However, as one moved up the terrace, the carvings disappear. This was apparently to reflect one's progress towards Nirvana, where one detaches from the world of form. Another interesting point was about the stupa. It looked like a dome but apparently it is a representation of a overturned rice bowl and a walking stick. This is to reflect Buddha's fasting and giving up worldly pleasures, and his walking stick to help him walk. The last interesting point was about touching the Buddha statues within the stupas. I related to Noordin about the story that if one could reach into the openings of the stupa and then be able to touch Buddha, one's wishes would come true. Noordin smiled and said that this was not really the actual story: "touching the Buddha" was meant to be figurative. If one understood the principles of Buddhism, then ultimately one would be able to "touch the Buddha". However, this was misinterpreted by the Dutch colonists as physically touching the Buddha statues. This, however, did not prevent me from stealthily reaching into a few stupas to touch the Buddha statues, and indeed I was able to touch them! At this time, there was already a large group of excited visitors all waiting to catch sunrise. The sun quickly rose, and while it was not as spectacular as what I saw on the internet, I was pleasantly moved by the still of the dawn, and the various bluish hues formed by the misty fields and mountains in the background. There was a sense of stillness, and a sense of peace, especially when our visit to Borobudur was made on the first day of the year of the Horse. We decided to walk around the compound, and do our usual ritual of snapping more photos. Visiting this made me want to check out Angkor Wat as well. Soon, I hope. I enjoyed the read. The pics look really good, esp the one of the buddha overlooking the landscape - mystifying, sacred, and peaceful. V nice way to spend the lunar new year. Thanks for the good read ... Made me wanna make my way there !